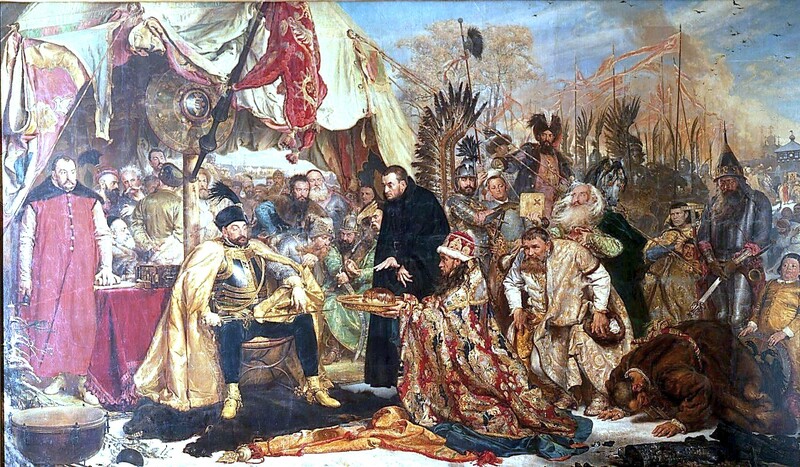 During the Livonian War (1578-1582), between Ivan the Terrible of Russia and Stefan Batory of the Polish-Lithuanian Commonwealth, the city was besieged by the Polish and Lithuanian forces. The joined army failed to capture the city, but forced Russia to return other territories and gained Livonia. The siege was the setting of this painting. The siege of Pskov from the Polish perspective: Batory at Pskov, 1579. Painting by Jan Matejko in 1872. Matejko's allegoric painting illustrates the concept of romantic nationalism: the Muscovites are represented doing homage to the Polish king, which appear victorious, although in reality Pskov never fell to the Poles, as the conflict ended with negotiations before the siege was concluded. Do you want to buy a giclee print on cotton canvas of this artwork from Jan Matejko ? For just a little more than a print you can have a hand made reproduction of a painting of Jan Matejko.